Mr. Rosa received the Boston Globe’s Art Merit Award in 1976, the Lockheed Martin Lightning Award in 2002, and the American Institute of Polish Culture’s “Special Recognition” Award in 2015. Rosa has spent a quarter century investigating America's legendary "discoverer." He has authored five books on Columbus in several languages other’ than English and has appeared on BBC, NPR, the Travel Channel's "Expedition Unknown," and numerous foreign-language media. His work was featured on the cover of Newsweek's Polish subsidiary in 2011. Mr. Rosa has advised UNESCO and the Hatian government on matters related to Columbus' lost ship, the Santa María . He has lectured on Columbus at American and European universities. Now regarded as the world's foremost authority on Columbus, Rosa's own "voyage of discovery" began during the Columbus quincentennial, when his doubts were stirred by the marriage of a lowly foreigner to a highborn Portuguese lady. Such a union might pass muster as a fairy tale today, but it would have been unthinkable back then. The closer Rosa looked, the more certain he became that he was on to something, and before long he was spending all of his free time on research. Manuel Rosa's paradigm-busting Columbus: The Untold Story , is double-winner of the 2017 Independent Press Award: in World History and Historical Biography. BOB LAMMING holds a master's degree in linguistics from San Francisco State and has been a teacher for nearly thirty years – of English to non-native speakers, college writing, and high school Spanish. He's translated four books and shorter works from Polish. Lamming has traveled in over two-dozen countries on four continents – all of it on his own, except for a year as a conscript with the US Army in Vietnam, and a year on a Fulbright Grant in Romania. Car-less for 23 years, he is passionate about bicycling as a way of life. Since the mid-1980s, he's toured thousands of miles solo across North America, including the entire Eastern Seaboard, from Florida to Labrador, and the West Coast from Seattle to L.A.
Born in Chicago and raised in St. Louis, he lives just outside New York City with his Polish-born wife, an independent bookseller whose extensive Polonian contacts supply most of Lamming's freelance work. Recruited on short notice to edit the newly written chapters of Columbus: The Untold Story , he continues to collaborate with its author. A special, limited edition – including abundant, new material, now appearing for the first time in English – was released on May 20, 2016, to commemorate the 510 th anniversary of Colón's death. 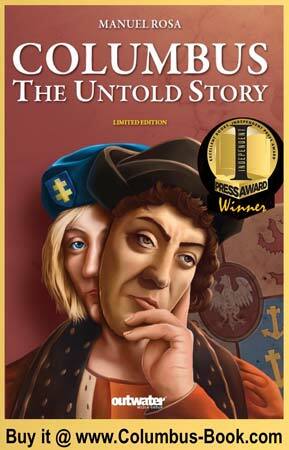 While supplies last, Columbus: The Untold Story , by Manuel Rosa, may be purchased on Amazon – or directly from its New Jersey sponsor, Nowy Dziennik, Polish Daily News.